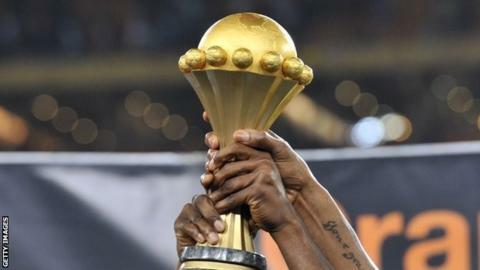 Morocco have been banned from the next two Africa Cup of Nations after failing to host this year's tournament. The country's football federation was also fined US$1m (£650,000) and ordered to pay 8m euros (£5.9m) in damages. Morocco had expressed concerns about hosting this year's event following the outbreak of the Ebola virus in Africa. They asked for the tournament to be delayed until 2016, but the Confederation of African Football (Caf) rejected the request. Equatorial Guinea were named as replacement host for the 16-team event, while Morocco, who had qualified as hosts, were expelled. Caf also fined hosts Equatorial Guinea US$100,000 (£65,000) for crowd trouble during Thursday's Africa Cup of Nations semi-final loss to Ghana. Tunisian Football Association president Wadie Jary was also banned from all activities by Caf after his organisation failed to apologise for accusing African football's governing body of cheating. Tunisia made the allegations after being beaten by quarter-final opponents Equatorial Guinea in controversial circumstances. The 2015 Africa Cup of Nations finishes on Sunday, when Ghana and Ivory Coast meet in the final in Bata.